Oregon Scientific, an action camera manufacturer, has announced the launch of the ATC mini, a small, lightweight waterproof camera. The ATC mini can be submerged to depths of up to 20 metres and also boasts 720p HD video recording. Weighing in at just 70g, the camera is the lightest waterproof action camera on the market. It comes equipped with 32GB of micro-SD memory card, which allows for up to 1.5 hours of play time. Designed for use in several situations, the camera be strapped to helmets, handle bars and surfboards via a range of different mounting systems. Other specifications on board the camera include the ability to shoot 1.3 megapixel still images, a lens with a 110 degree field of view and temperature tolerance between 0 degrees and 40 degrees celcius. A removable, rechargeable lithium battery is included, along with a silicone sleeve, TV-out jack, a Mini USB jack and a built in microphone. 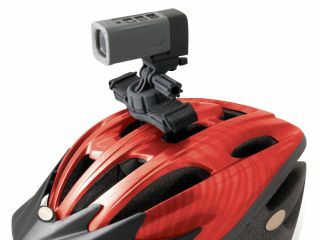 It comes equipped with a vented helmet mount, specifically designed for attaching the camera to cycling helmets. The Oregon Scientific ATC Mini UK price is £199.99 and will be available soon.